This past weekend a blue skinned man with red eyes became the object of pure jubilation. It began in a convention center in London, then promptly spread across the globe all under the banner, “Thrawn is back.” As many Star Wars fans of Timothy Zahn’s early 1990’s trilogy know, Grand Admiral Thrawn’s role as the antagonist of a freshly established New Republic not only kicked off the second wave of Star Wars fandom with rapidly growing Expanded Universe, but made the character one of the great villains of the Star Wars universe. For more than two decades, Thrawn remained the pinnacle of Imperial adversary, cool, calculating, and a brilliant mind all set toward the defeat of our favorite heroes. Then Disney acquired Lucasfilm and declared the Expanded Universe that had existed for nearly as long as Thrawn, null and void. In a heart beat, Thrawn was gone. His loss, among other popular Expanded Universe characters, such as Mara Jade for example, set off a firestorm of anger and unrest among the fandom. Shelves upon shelves dedicated to the Star Wars canon were delegated to the status of “Legendary” and the new canon, the new Expanded Universe, re-established as the films and television which had existed up to that point, and then all new publications/products to come. Even despite the passage of several years, a look at Pablo Hidalgo’s twitter feed, one of the fine gentlemen at Lucasfilm in charge of Star Wars content, still reveals questions that border on pleas to bring back characters and content from the old Expanded Universe. At Star Wars Celebration Europe, the fans got their wish. Thrawn was returned, animated, and in the trailer for Star Wars Rebels Season Three. Thrawn’s return was not the first time content from the old Expanded Universe made the jump to the new canon. At the forefront of this effort, unsurprisingly, has been the Rebels television show (airing on DisneyXD). In a manner, Rebels has always existed as a vehicle to draw upon the past to inform the present. Created by many of the same team headed by Dave Filoni behind The Clone Wars, Rebels exists in a narrow window of time prior to A New Hope. It focuses on the nascent rebellion against the Empire, specifically on a band of mixed individuals who constitute the crew of the Ghost. 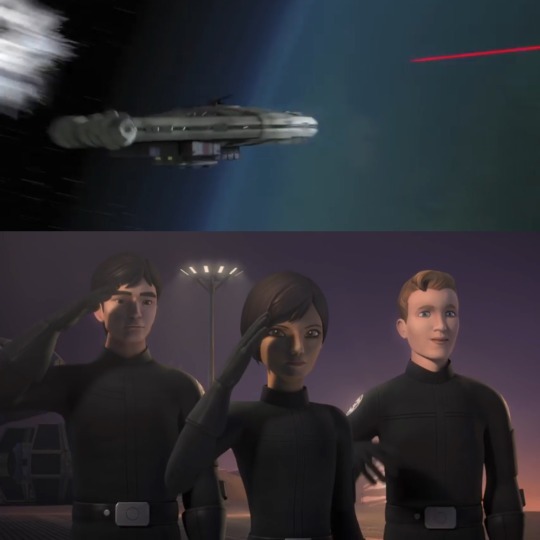 In developing the show, the Rebels producers Simon Kinberg and Filoni, have spoken of drawing upon not just the physical look of Star Wars (inspired by Star Wars visionary Ralph McQuarrie), but also the thematic elements of the Original Trilogy. At the heart of Rebels is a show that knows its, the franchise’s history, and works it seamlessly into one entertaining episode after another. The production team cannot even forget their own history, pulling multiple well known and loved characters from that show to feature in their current work. As a result, it’s a show which revels in its ability to consider the past for its storylines, settings, and characters. Their willingness to reach into the old Expanded Universe is best highlighted by the Season Two finale, “Twilight of the Apprentice,” which requires three of the characters, Kanan Jarrus, Ezra Bridger, and Ahsoka Tano (Tano a main character from The Clone Wars), to travel to the forbidden Sith planet of Malachor. On the way there, Ahsoka, a former padawan of Anakin Skywalker, answers a question of Bridger’s, “There’s always a bit of truth in legends.” This direct call back to the now “Legends” Expanded Universe was a not too subtle wink to the fans of the show due in part to their planetary destination, Malachor. In the old canon, Malachor was heavily featured in the Knights of the Old Republic, an extremely popular game franchise, and as the episode soon revealed, a certain degree of that Star Wars history was re-canonized by Rebels. Beyond the show’s built in modus operandi of seeking inspiration in the past of Star Wars (in-game and out), there is one other reason for why Rebels remains the go to source for transferring legend into canon. The production team is full of fans. 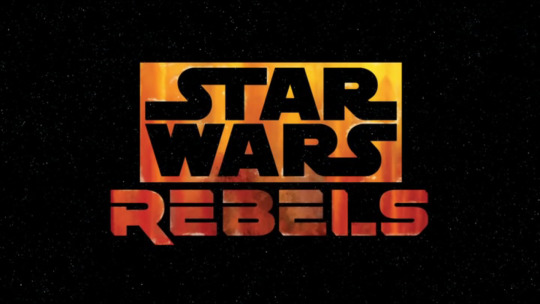 At the Rebels’ Star Wars Celebration Europe panel, the same which announced the return of Thrawn, Dave Filoni repeated a phrase a number of times when referring to himself and to the talented team of Rebels, “I’m a fan….” “She’s a big fan…” “We’re big fans of Thrawn…” Rebels is a Star Wars show made for Star Wars fans by Star Wars fans. They possess the same passion and attachment to the past Expanded Universe as the rest of the franchise’s fans, having grown up within it just the same. The result is a team who are pulled back to it, both by their own nostalgia and love, and no little empathy for their fellow fans. 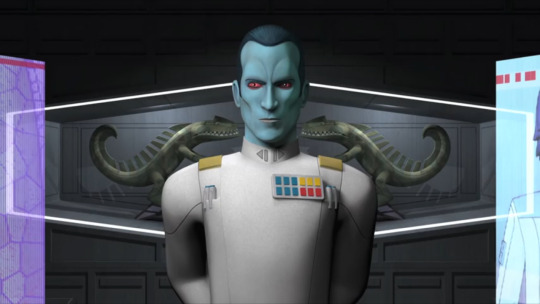 Thrawn was revealed in the Season Three trailer for Rebels, but he was not the only piece of the old Expanded Universe to make an appearance. It also immediately re-established Wedge Antilles’ past as an Imperial Academy deserter for the rebel cause, and simply, entirely for the fun of it, dropped a cameo of a Corellian YT-2400 light freighter. Between the two, the YT-2400 best symbolizes what Rebels represents. A ship of that model designation originally appeared in a Lucas Arts game, Shadows of the Empire, called Outrider and owned by the hero of the game, Dash Rendar. Rendar, the Outrider, and Shadows of the Empire, all fell into the old Expanded Universe. When its presence in the trailer excited fans at the prospect of Dash Rendar’s return, Filoni broke the hard news that it wasn’t the Outrider, but simply a YT-2400. Then why did the Rebels team include it? Simply a nod to the past. ← Riffing on Star Wars: #4 – Droids, Slaves or Machines?